Stencils Can Make Your Patio The Perfect Retreat! Good morning, my DIY savvy friends. As you know, Cutting Edge Stencils has been buzzing about stenciled outdoor projects to get your exterior ready for the big kick-off to summer. From a stenciled outdoor rug to a stenciled outdoor table, we’ve been crossing projects off the list one by one. If patio plans are on your agenda, you’ve come to the right place. Whether you’re building a new patio or renovating an existing one, we have an absolute dreamy design idea along with some helpful tips to help you create the perfect stenciled patio. Yup, you read that right. Stencils are the perfect way to spruce up your patio and get that designer look you desire but for a fraction of the cost. We’d like you to meet Jill Bennett, one of our fabulous stencil fans and creative DIYer. 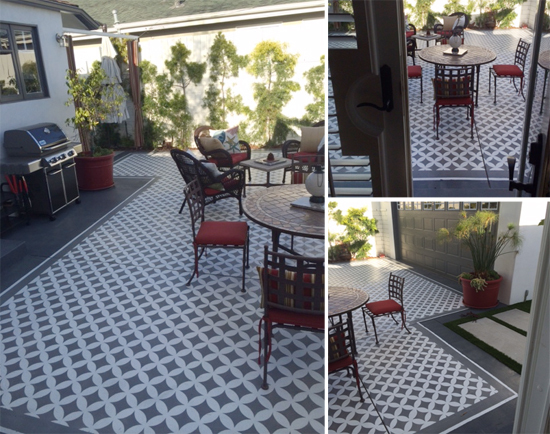 Jill recently sent us pics of her stenciled patio and let’s just say that our jaws hit the ground when we saw her space. To start the project, Jill first cleaned the concrete and applied a concrete bonder similar to BEHR’s Concrete & Masonry Bonding Primer. The primer is used for optimal paint and stain adhesion. 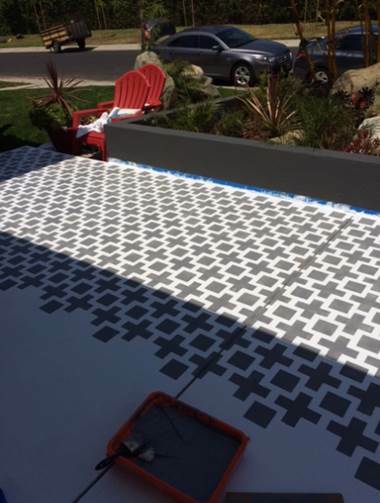 Once the primer was dry, she painted the patio a crisp white using a concrete paint similar to Benjamin Moore’s Floor and Patio paint. Jill said she needed two coats to adequately cover her patio. The next step was to paint our Square Plus Allover stencil. She selected a color similar to Benjamin Moore’s bachelor blue 1629, a deeper, muted blue-gray with a rich feel. She chose to start at the furthermost end of the patio in the corner. She used blue painters tape to hold the stencil in place and a dense foam roller to apply the paint. Before applying the paint, she would off roll the roller on a piece of paper towel to ensure there wasn’t too much paint on it. Then she used a very light amount of pressure when painting the design. 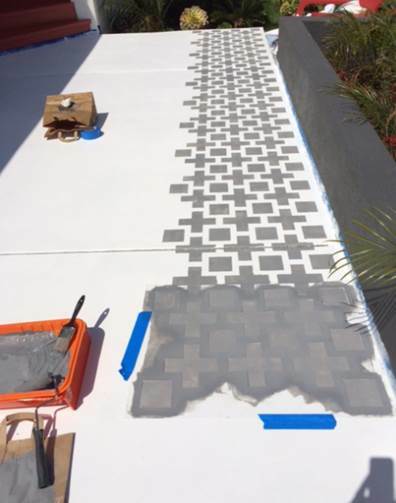 Because the concrete is porous, she needed to be extra careful about paint seepage under the stencil design so it was super important that she didn’t over coat the roller with paint. Jill worked vertically down the patio (in columns). Jill continued the geometric design across her patio. To finish it off, she painted two coats of a polyurethane to seal the design and give the patio beautiful sheen! But wait, it gets even better! Jill must have been bitten by the stenciling bug because after she finished stenciling her front patio, she decided to add some patterned flair to her backyard. For this project, she used our Nagoya Allover stencil pattern. She taped off a T-shaped pattern on her back patio and then followed the same steps she did for the front patio. On the outside of the T-shape, she painted the patio a deeper gray. We think her stenciled space looks awesome! 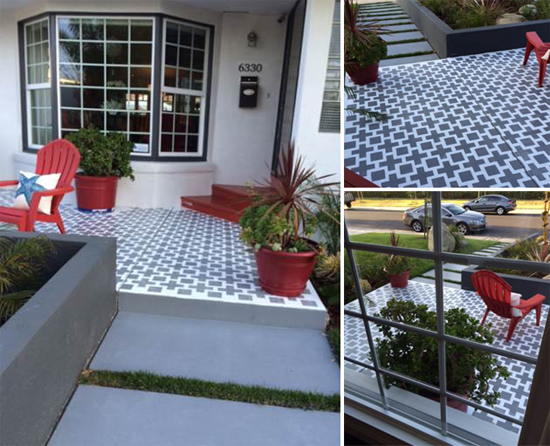 Tell us what you think about this stenciled patio project. Leave us a comment below! Paint-A-Pillow Makes DIY Accent Pillows Easy!